Jim Levine! A delightful, top-drawer citizen! Wow, I'm really glad that you posted this. I cannot express how much I appreciate the efforts at Mutant Sounds for culturally enriching humanity with such delightful ephemera. Wow... I just recently discovered MUTANT SOUNDS, and this Croiners tape is one of the first things I grabbed. Had seen the name on many compilations and decided to listen. Amazing work. This is the kind of tape loop fuckery I should have grown up with! Thanks so much for upping this, and the other great things here. Man, thanks so much for this. 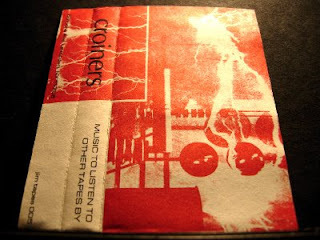 I first heard Croiners on Dry Lungs 2, and that brief, twisted track (yet another 'untitled') has always done extremely weird things to my brain. Now that I finally decided to dig deeper, I realize that this is one of a very select few who can be considered 'peers' of Tom Ellard and his early Severed Heads alumni. If anyone needs more, the only other release that I've found so far is 'Where Did the Watermelon Come From'. Thanks again, great work here.